*In-stock only. Discount taken from MSRP and cannot be combined with any other discount, coupon, or promotion. Some restrictions do apply. Sale ends September 3, 2016. *Purchases must be paid in full to qualify. Discount taken from MSRP and cannot be combined with any other discount, coupon, or promotion. Some restrictions do apply. Sale ends September 3, 2016. *APR applies only on select models. APR covers 3asy Ride up to 48 months and conventional 60 month loans, and is subject to credit approval through BMW Financial Services. APR covers 3asy Ride up to 48 months and conventional 60 month loans, and is subject to credit approval through BMW Financial Services. Shopping Spree offer ends September 3, 2016. 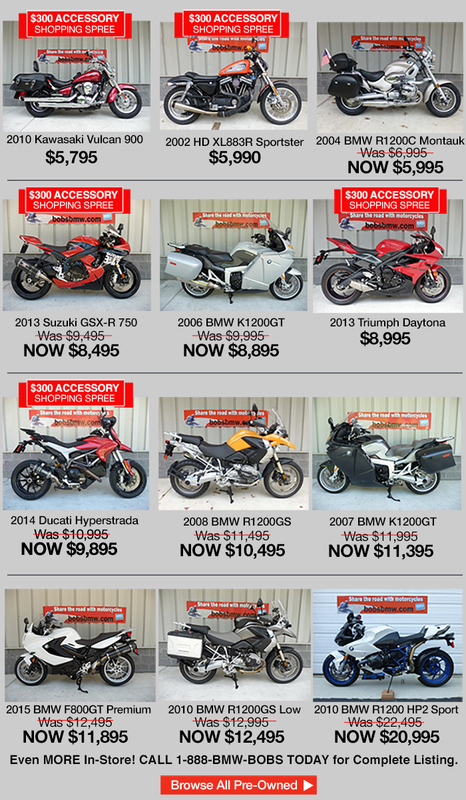 The shopping spree applies to accessories only, is only eligible with specified models, and varies by model. Shopping spree CAN be combined with current factory incentives and BMW purchase programs (i.e. military or emergency personnel); however it cannot be combined with exclusive Bob’s BMW programs (i.e. new rider, MSF coach). Please ask yours sales person for complete eligibility details and required documentation. Some restrictions do apply. *Shopping Spree credit ends September 3, 2016, applies to accessories only and is only eligible with specified models. 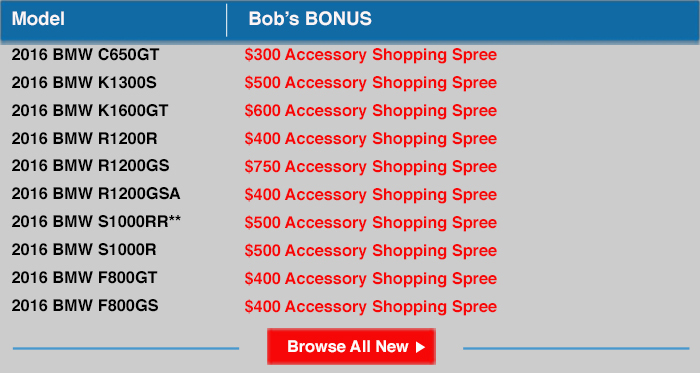 It cannot be combined with exclusive Bob’s BMW programs (i.e. new rider, MSF coach). Please ask yours sales person for complete eligibility details. Some restrictions do apply.